Salesian spirituality challenges us to become holy--to become saints! Salesian spirituality is often described as a "spirituality of the heart," the place in which divine love and human love become one in the same. Love alone motivates and sustains our quest for holiness. 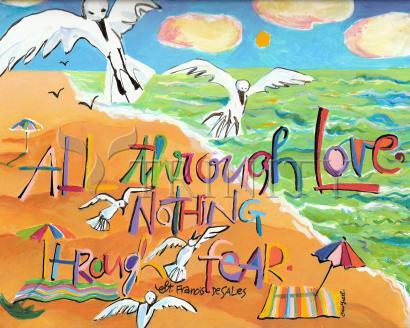 "Do all through love, nothing through fear,” wrote Francis. As we know, love is hard work: it isn’t for the faint of heart. It requires knowing when to take hold and knowing when to let go. In an age that over-emphasizes self-actualization and self-fulfillment (often at the expense of others), Salesian spirituality points to a different way to find fulfillment and happiness. It calls us to practice interior discipline, to practice the "little virtues": patience with aging parents or rebellious teenagers, gentleness and humility with friends and co-workers, and simplicity in our lifestyle. In the quiet of our hearts we learn to turn everything over to God, to die to our self-absorption, to live totally for Jesus by loving one another. Salesian spirituality understands that spiritual progress comes slowly and, often, at great cost. At the same time, is also maintains that in turning our hearts to God and in doing God's will we find our greatest happiness and fulfillment.